Katharine and Audrey Hepburn, Greta Garbo, Ingrid Bergman, Rita Hayworth, Ginger Rogers and Lauren Bacall are but a few unforgettable leading ladies of Hollywood’s Golden Age (late 1920’s to early 1960’s). Of all the alluring women from that period, my absolute favourite is Grace Kelly. In addition to her natural good looks, poise, sophistication and femininity, she possessed an element of mystique which intrigued me and I yearned to know everything about this classic beauty. Maybe I further warmed to her because she too was born in November and had a nasal voice! 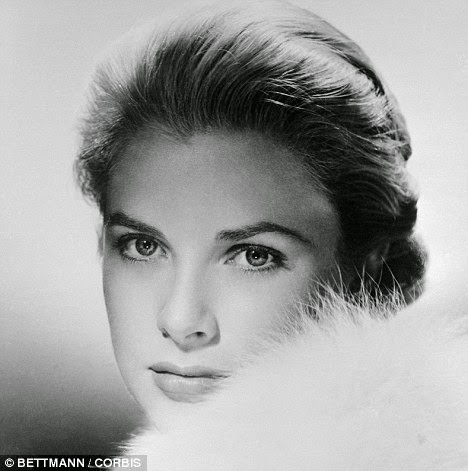 Mostly, I find myself drawn to Princess Grace because of her serenity. The calmness she exuded is a quality my soul demands more of to offset my feistiness. I admire the way she held herself as a lady at all times regardless of her private turmoil. For me, she is the epitome of elegance so, in honour of this exquisite woman and fellow scorpion this post details how we may add a touch of ‘grace’ in our lives. Elegance has to do with how we look, speak, behave and move and these are all influenced by a feeling that emanates from within as a result of our self-assurance. Epictetus said “Know first who you are, and then adorn yourself accordingly” so, through a process of reflection and self-evaluation you must discover who you really are, fully accept yourself then put thought and effort into accurately projecting your essence to the world. Start by being true to yourself; listen to your heart to determine what makes you happy and what you really want to achieve in life. Identify your passions and abilities then develop your strengths to realise your full potential. By doing what you love and are good at, this will form feelings of worthiness which will raise your self-esteem empowering you to pursue your goals and get the most out of life. Furthermore, as you gain confidence you will feel comfortable in your own skin and through your authenticity and self-love, radiate a positive self-image making you appear elegant. To look naturally gorgeous and graceful, aim to have a gentle inner nature as this will be reflected in your facial expressions. When you have a kind heart it will shine through to your face and eyes, softening your features thus producing a pleasant disposition. Create a kind spirit by letting your heart overflow with compassion for others as well as yourself. Be friendly and polite to everyone you encounter and always think loving and optimistic thoughts to exude a warm, peaceful vibe as your calmness will create a lasting loveliness, making you easy to be with and drawing people towards you. What’s more, a sweet settled temperament impacts both your physical and emotional state and leads to clearer thinking and in turn better decision making. When it comes to clothing, the golden rule for true elegance is simplicity. Less is more. Your style should be effortless and understated; the outfit should complement not compete with you. Select classic pieces that are well cut, of good quality, comfortable and fit properly. Know what looks good on you - which colours complement your skin tone, what styles flatter your body shape and most of all, suit your personality. Exercise common sense and dress appropriately for each occasion but don’t tone down your look to blend in with the crowd. Look your best every time you step out of the house because when you look good, you feel good and when you feel good you smile and by smiling you actually look attractive because you appear happy, secure and fun-loving. Be guided by fashion to keep your look updated but you shouldn’t spend all your hard earned cash on the latest trends. Instead, spend wisely on items you love and get maximum wear of your clothing by pairing new pieces with what you already own to create unique outfits. Never imitate someone else’s style because this will only negatively impact your self-esteem as you’re being someone you’re not. Be your own person. Own the look by adding your personal touch and ensure it accentuates your best assets and aligns to your true character so you stand out in your own right. Along with good attire, your personal grooming should be impeccable. Skin should be clean and healthy looking and with daytime make-up opt for a light, natural look which highlights your features. Darker, more defined shades may be worn in the evening. Hair should be tidy and clean as should hands and fingernails (no chipped nail polish ladies!). Eyebrows should be neat, shoes should be clean and comfortable and you should always smell fresh and nice. Look after your body by maintaining a healthy weight with a balanced diet and regular exercise to foster a positive body image. Also, organise your time and schedule so you are not constantly rushed and take time out to relax and re-energise to avoid looking stressed and exhausted. Your posture speaks volumes about your feelings for yourself and it’s actually the first thing I notice. Poor posture signifies low self-esteem and makes you appear unapproachable so please don’t slouch – ever! Keep your back straight, lifting up from the ribcage, shoulders back and head up, looking ahead not down at the ground. Whilst improving our external attributes certainly contributes to looking graceful, I believe the main quality which enhances our attractiveness and makes one truly elegant is humility. Develop a humble view of yourself by curtailing your egotism and releasing any attention-seeking behaviour. This does not mean you think less of yourself or place yourself below others; you love, respect and take care of yourself but simply become less self-absorbed. Focus on others and make them feel good about themselves in your presence by treating them as equals. Genuinely listen when people are speaking as you may gain new and valuable insights which will add to your personal growth. Acknowledge all people you meet by making eye contact and smiling and be considerate and gentle at all times. Accept people for who they are, as they are and know there’s always more to learn so aim to be the best you can be rather striving to be better than others. Let go of your pride and accept accountability for your actions; admit when you are wrong, apologise when necessary and quickly forgive others as well as yourself because no one is perfect and develop a sense of humour to see the lighter side of things. Remain grounded with an attitude of gratitude for all you already have and give selflessly to others (particularly those in need) – your time, money, attention, affection, encouragement, understanding and praise. By making a difference to another’s life you appreciate what you have even more and create feelings of joy thus produce more happiness in your life. Essentially, elegance is about simplicity, composure, discretion, refinement and self-esteem. Your emotions about yourself translate through your presentation, mannerisms and movements. When you look beautiful in all you do - the way you dress, move, speak and behave you will feel beautiful and more importantly, self-assured and like Princess Grace, exude a magnetism that will attract the attention and the admiration of others. Know that you can be elegant in any moment no matter what is happening in your life because it’s a mind-set, an attitude that is cultivated through confidence and shines from your heart. Elegance is a state of being. “Adornment, what a science! Beauty, what a weapon! Modesty, what elegance!” ~ Coco Chanel.